The following eyeshapes are unsettled. There is a nakade to kill them. See straight three. 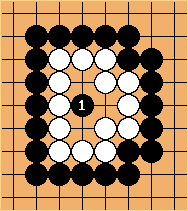 Black can almost fill the eyespace with two stones, leaving White with a dead eyeshape. See bent three. Same comment as above. The shape here is known as the Pyramid Four. 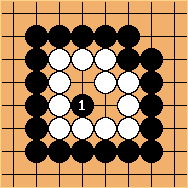 Black has a nakade at 1, the vital point. 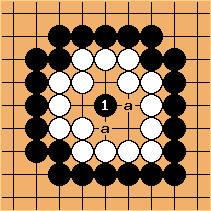 White is reduced to a single eye, which Black can almost fill with straight three or bent three. White is dead. 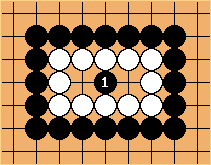 In this cross of size 5, Black can kill White by playing at 1. Next he can almost fill with a pyramid four. 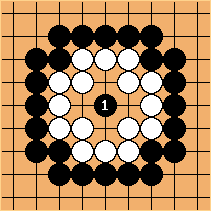 This shape, nicknamed the 'bulky five' in English, is killed by the placement at 1. Next, he can almost fill with a squared four. White does have a ko threat to live at a. This is the so-called rabbitty six. After 1, Black can almost fill this eyespace with a bulky five and White can do nothing about it. 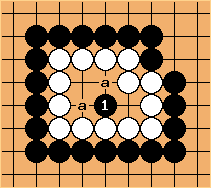 As for the bulky five, White can threaten to live at a as a ko threat.